Last March 13, 2019, the largest Video-on-Demand service in Southeast Asia, has announced its first foray into Filipino originals with Ulan. Ulan is HOOQ’s first Original Movie from the Philippines, in partnership with one of the country’s most renowned and respected production companies, Viva Films. Ulan will be playing in all major cinemas nationwide starting March 13. Philippine romantic drama film writer and director Irene Villamor, incorporates local "Tikbalang" folklore into Maya's (Nadine Lustre) coming-of-age journey and self-acceptance as her ideas of love fall apart. After losing her parents in a stormy sea, Maya was left in the care of her grandmother (Perla Bautista). Perla tells her that the reason why sometimes rain falls while the sun is still shining is because "may mga tikbalang na kinakasal". The heavens cry as the mythical creatures seal their forbidden love in marriage. The sunshowers remind her of the time she witnessed tikbalangs in their moment of bliss, and the orphan Maya soon builds her romantic fantasy around the local folklore's fairy tale ending. The film follows the young adult Maya through her of pre-empted romance with former college classmate Mark (A.J. Muhlach) and short-lived relationship with Andrew (Marco Gumabao), whom she met in a wedding event where her bestfriend Topi (Josef Elizalde) was the couturier. She finally gets lucky in love with Peter (Carlo Aquino), the man who made her trust in the Tikbalang stories and her own capacity to love. 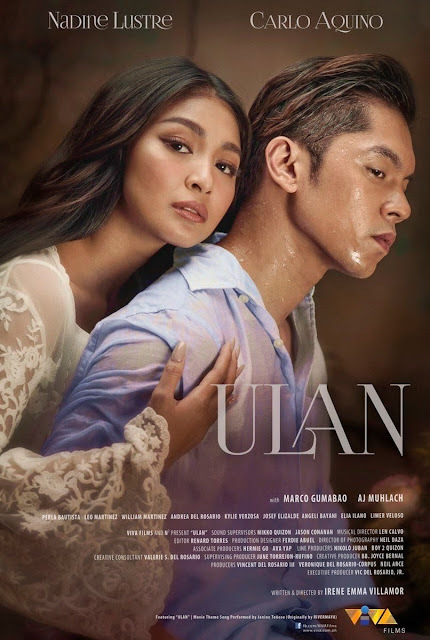 ULAN is topbilled by Nadine Lustre, Carlo Aquino, Marco Gumabao, and AJ Muhlach. Get over 30,000 hours of hit movies and TV series including titles from HOOQ local partners when you subscribe. Smart users can enjoy a 30-day free trial. Globe mobile users can enjoy a 45-day free trial; and Globe broadband users can enjoy up to six months free trial. So hurry and sign up today for a complimentary trial at www.hooq.tv.